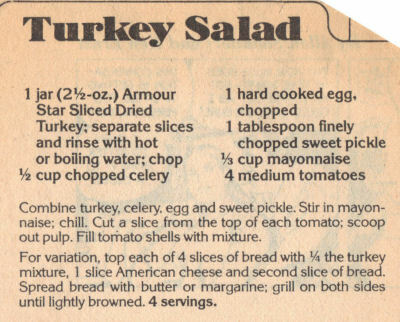 This recipe was clipped from a newspaper and is a promo for Armour Star Sliced Dried Turkey, date unknown. Recipe is typed below along with a scanned copy. Combine turkey, celery, egg and sweet pickle. Stir in mayonnaise; chill. Cut a slice from the top of each tomato; scoop out pulp. Fill tomato shells with mixture. For variation, top each of 4 slices of bread with 1/4 the turkey mixture, 1 slice American cheese and second slice of bread. Spread bread with butter or margarine; grill on both sides until lightly browned. 4 servings.